﻿ Which types of stars become pulsars by collapsing into themselves? Which types of stars become pulsars by collapsing into themselves? A pulsar is the last living sparkle of a dying star that its mass is high enough to preserve its core rotating, and the last way to resist collapsing into a black hole by being forced the gravitational force. Stars that its fusion force in their centre is not enough to support their core against the gravitational collapse start to lose volume by increasing the density of its core. Hence, the dying stars are getting smaller at the end of their life circles(a star's life circle) as balloons having leaks. 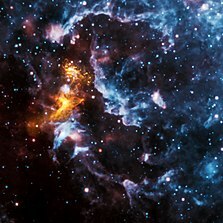 A pulsar had been a massive star during the beginning of its life in the universe. When massive stars collapse, their cores reach to the Chandrasekhar limit (approximately 1.4 M☉ or 2.765×1030kg) as a result of that a massive star cannot withstand against the gravitational force of its core through electron degeneracy pressure as a white dwarf can. Exceeding the Chandrasekhar limit causes a type II supernova and allow electrons and protons to combine for forming neutrons by increasing the heat of the core. According to NASA, “The second type of supernova occurs at the end of a single star’s lifetime. As the star runs out of nuclear fuel, some of its mass flows into its core. Eventually, the core is so heavy that it cannot withstand its own gravitational force. The core collapses, which results in the giant explosion of a supernova(1).” Once electrons and protons combined to form neutrons due to the heat of the core, neutron degeneracy pressure is the only thing resisting to the gravitational force in the core of the star. As to stellar evolution, the remnants of a type II supernova are called a neutron star. Because of the ballerina effect, every spinning object wants to retain their spins without changing the angular momentum hence neutron stars rotate rapidly (such as PSR J1748-2446ad spins 716 times per seconds(716 Hz)). The rapid-spinning of extremely massive and dense objects like neutron stars causes to beam electromagnetic radiation via very high rotation speed, which is the explanation of why pulsars are “blinking”. (5) Berman, Bob. "Tomorrow’s Sun." The Sun's Heartbeat: And Other Stories from the Life of the Star That Powers Our Planet. New York: Little, Brown and Company, 2011. 253. Print.